While changing the battery in the family wagon Saturday morning my birdy-senses were on high alert for any shenanigans going on in the backyard. A birder neighbor one street over had recently posted to a Utah birding listserv about having a Peregrine Falcon and a Merlin at her property, so I was more tuned in then usual. Dark-eyed Juncos, Black-capped Chickadees, and House Sparrows frolicked at the feeders. A Red-shafted Northern Flicker called nearby followed by the calls of Western Scrub-Jays. I heard a Spotted Towhee's hoarse mew from the neighbors hedge. Speaking of hoarse, I have a little Black-capped Chickadee that sounds like it has a sore throat with a very rasping call. Kinda cure really. Suddenly, I heard a loud commotion at my BT3-inspired backyard brush pile. 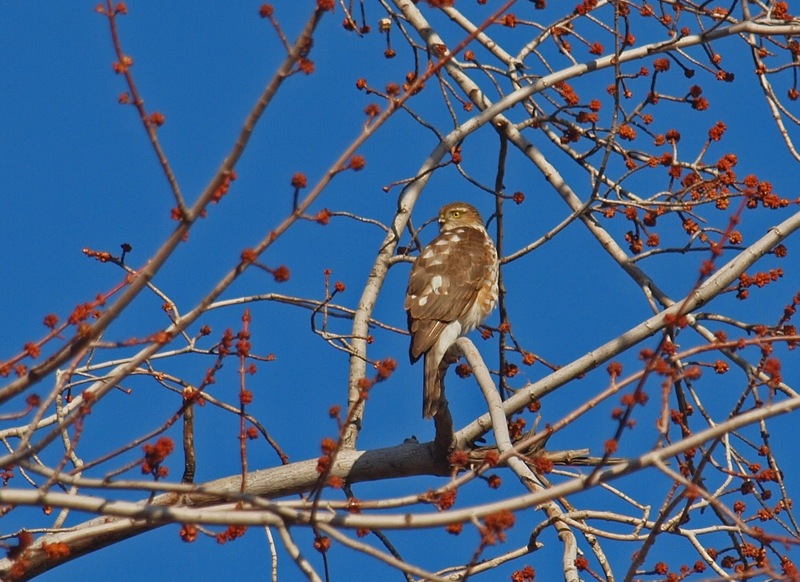 I looked back just in time to see a juvenile Sharp-shinned Hawk miss its prey and alight in my tree. It remained perched there for sometime and I was able to snap the photos posted here. I had returned to the car battery replacement when another irruption of birds occurred at the brush pile. I turned to find two juvenile Sharp-shinned Hawks in flight trying to steel food from a large adult Sharpie perched on our dilapidated tree house with a House Sparrow clutched in its deadly talons. I went for my camera hoping to photograph the breakfast being consumed as well as the juveniles trying to get some samples. The adult darted off to a nearby pine tree that fortunately did not come down during the recent wind storm. So I missed the photographic opportunity. Through my binoculars I was able to watch as the House Sparrow complete its circle of life. Observing this backyard birding event leaves me wondering...and maybe some knowledgeable birders out there can weigh in...are the two juveniles the offspring of the adult? and are they still dependent on the adult for some of the food as they are not yet as skilled hunters? Is it normal for juveniles to still be around adults this late in the year? or was this all simply a chance encounter of three Sharpies? Great story! I had a very similar weekend with a Cooper's Hawk in my backyard. Both are beautiful birds! Cool observation. As far as I know, young accipiters are never associated with their parents this time of year, and I don't think I've ever even seen one accipiter attempting to steal food from another. Pretty unusual sighting, I reckon. Great post and very exciting story. I don't know the answer to your question. A couple of years ago I saw a hawk chasing a dove while the dove's mate was chasing the hawk. The three of them were in a line not more than just a few feet apart from one another, all while banking sharp turns left and right, up and down and all over. it ended when the lead dove flew headlong into some bushes, the hawk pulled out of the line and flew over the bush and the trailing dove went into the bush as well. Any Air Force fighter pilot would have been very impressed if they could have seen it. Robert, I love encounters like this. It gets your heart pumping! I had a sharpie fly into my backyard tree on Sunday right beneath a perched red-tailed hawk! Wish I had answers for you, but I don't. Your last photo is perfect because the bird looks like it has a questioning look on its face. A very cool sight for you to witness! I'd be interested to know the answers to your questions. 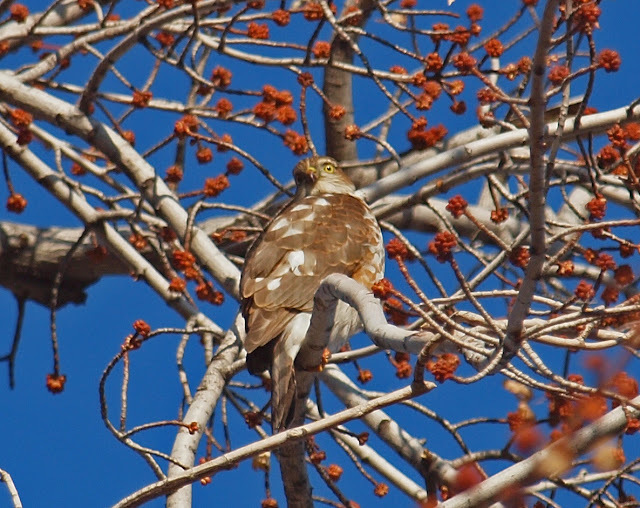 Wonderful photographs of the juvenile Sharp-shinned Hawk! That would have been so fun to see. Thanks for sharing.